Let’s start with the basic looks first. From the overly bulky and wide bell-bottoms, boot-cut jeans managed to emerge in the fashion world – thank goodness! – because of the growing demand for more feminine trousers. 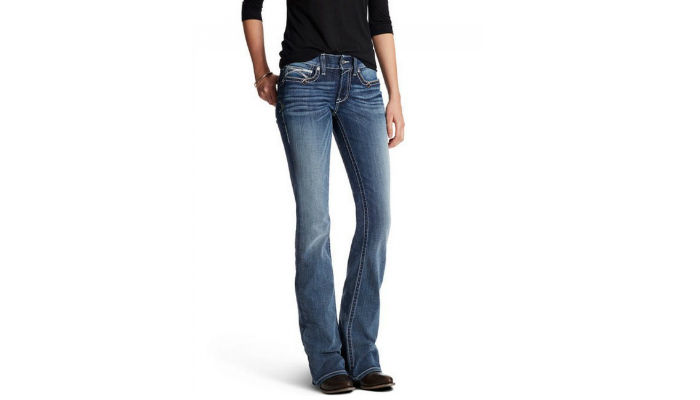 Boot-cut jeans have slimmer flares due to tighter knee sections. Denim boot-cut pants are just so perfect to pair with cowboy boots. They also match well with any top, whether it is a casual or a semi-formal one. We do not recommend boot-cut pants of other colors, especially bright ones. Cowboy boots are rugged types of footwear, and we must acknowledge that. Blue denim is an ideal material for the pants to capture the essence of cowboy boots. You can take ruggedness up a notch with ripped jeans. Cowboy boots plus ripped jeans can contribute to a boho-chic look, especially if the top looks like a poncho with fringes and an exotic brown color. 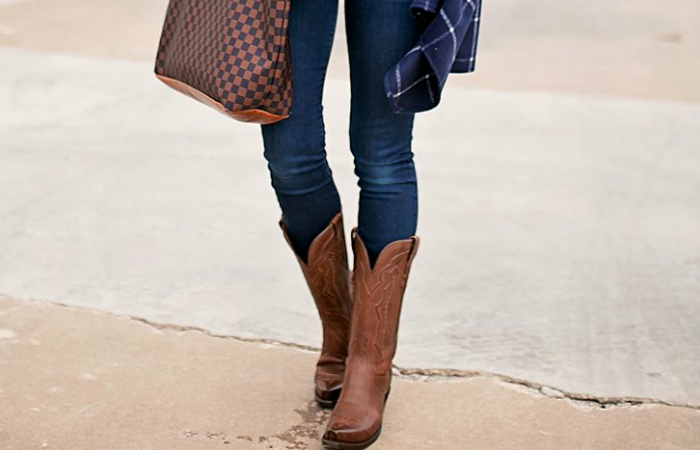 The entire outfit will look even better if the cowboy boots have beautiful details in a brown or black background. It may look over-the-top for some people, but it is a great outfit for fun, rowdy parties. You will never go wrong with denim shorts when you want to wear cowboy boots. Paired with any casual top, you can go anywhere with this outfit – except for formal parties, of course. Also, do not be afraid to go shorter than usual. 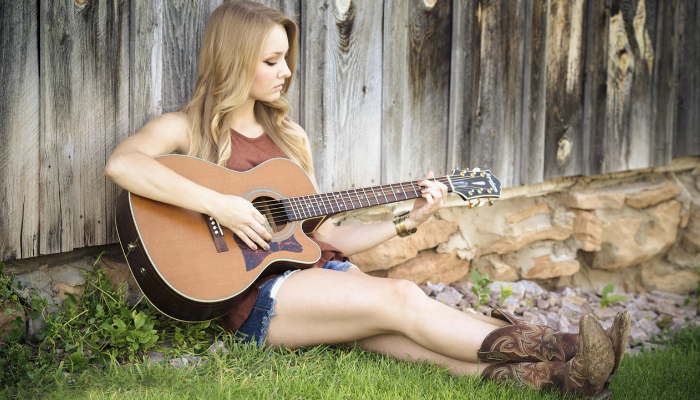 Skimpy denim shorts can appear stylish with a T-shirt, a wide brown belt, and a fashionable pair of cowboy boots. This is probably the sexiest look in our list. This type of jeans is a perfect combination of ruggedness and elegance. The denim material makes it rugged while the clean look of skinny jeans provides a classy vibe. Denim skinny jeans look even better with long cardigans and black tops. You can go to work and hang out in a high-end cafe later with this outfit. This look is also perfect for the autumn season. 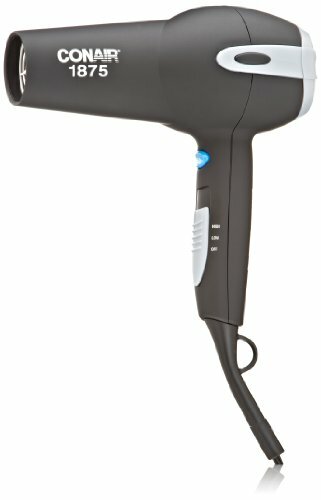 It keeps you warm without the need for thick jackets and sweaters. No wonder a lot of high school and college students love to pair their black leggings with loose tops and high-cut footwear; the whole outfit looks cool and edgy. Since black leggings are perfect for any type of high-cut shoes, why not spice up these bottoms by wearing cowboy boots? Black goes with any color and even provides a slimming effect to perfectly match your legs with boots. Cowboy boots can add volume to your calves, and wearing black leggings can solve this. To totally avoid unnecessary bulges, always choose long tops for your leggings. 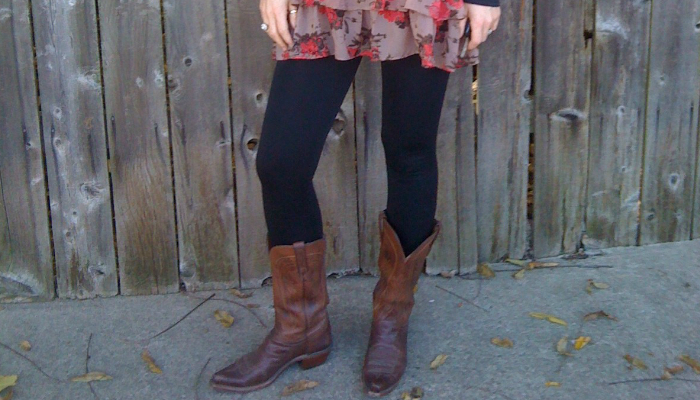 Loose, straight-cut dresses are ideal for cowboy boots when you want to go boho chic. The looser the dress, the more rugged it looks. Some ladies even prefer their dresses to have a dull, washed-out color to match flawlessly with their curls, accessories, and eye-catching shoes such as cowboy boots. This look is usually paired with brown, fringed shoulder bags. It is typically worn in music festivals. You can also wear decent dresses to complement cowboy boots. The best ones are those that have solid colors and a tighter fit. If the dress is too minimalist for your taste, you may wear a patterned or brightly colored scarf to balance everything out. It is also best to wear slimmer cowboy boots. In this case, the cowboy boots will appear like regular leather boots which is stylish for more formal settings. Surprise, surprise. 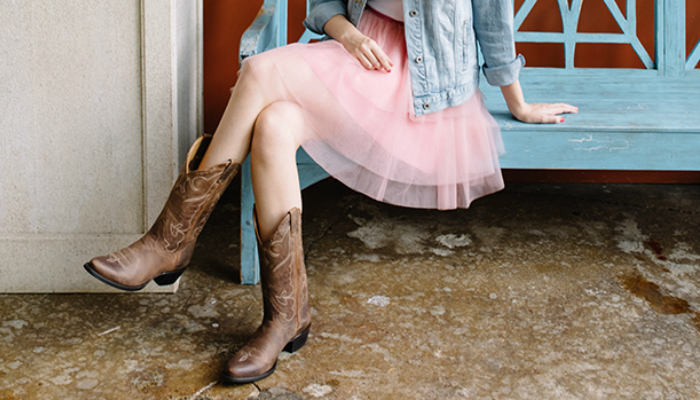 Even the girliest type of skirt can go well with cowboy boots. To pull this off, high-waist skirts are more appropriate. Emphasize the waist by wearing a thick belt. Then, make sure that the length will not go lower than the boots. Just a little bit of skin is enough to avoid the illusion that you are shorter than your actual height. There must be balance with long garments and high-cut footwear, so be careful. Meanwhile, this look is a little tricky for women with an apple body type since cowboy boots are more suitable for high-waist skirts. 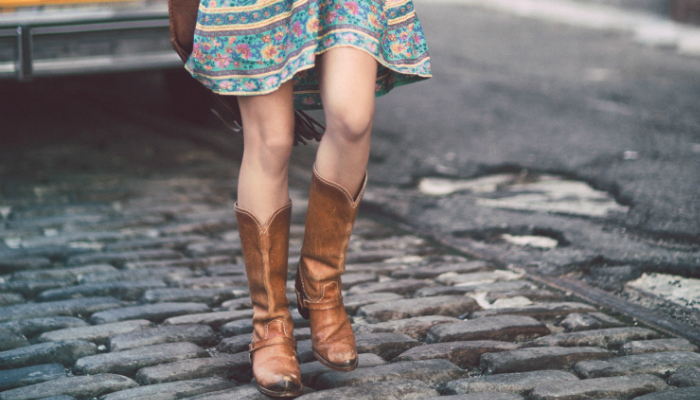 Another surprising thing about cowboy boots is how good they look with colorful intricate patterns. Turns out, as long as the boots have a solid black or brown color, they will look great even with the most colorful kind of dress. This outfit is also ideal if you want to pull off the boho chic getup. To ace it, choose a colorful dress with exotic Moroccan patterns. The same idea goes for pencil skirts. 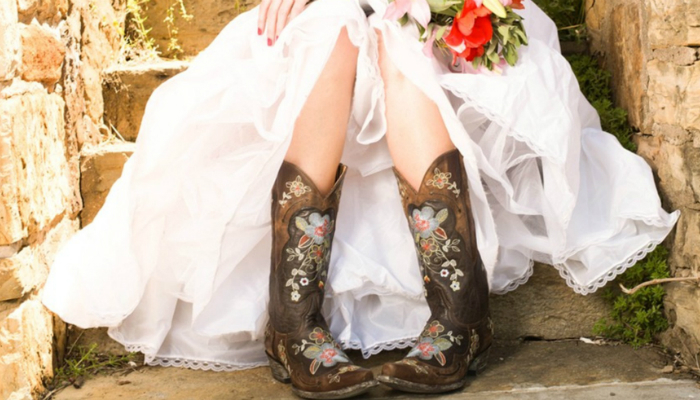 Thinking about wedding gowns and cowboy boots in just one context seems weird since we are so used to the conventional idea that brides must wear high heels. However, there are a lot of designs for cowboy boots. Some pairs are so feminine with their pastel colors and elegant patterns. If cowboy boots look so horrendous with wedding dresses, this ensemble would never be a trend in the first place. It doesn’t hurt to go out of your comfort zone when it comes to fashion. As long as you have a good taste of colors and design, you will surely ace the wedding dress and cowboy boots combination. It is amazing how the fashion world keeps on providing women more styles to choose from because of bold designers. 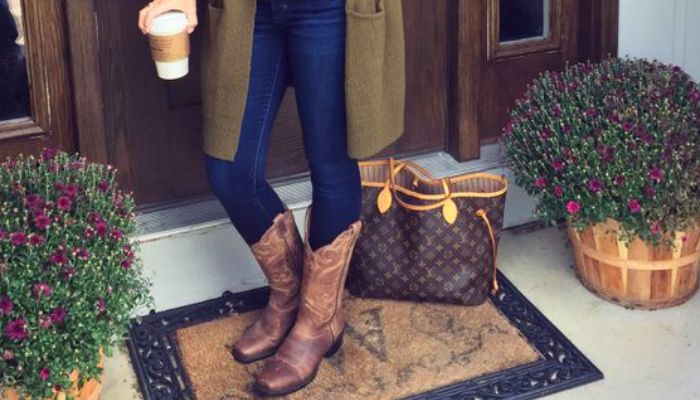 Cowboy boots for women’s clothing is definitely a brave move for trendsetters. However, it all worked out in the end because these supposedly masculine boots actually look stylish with dresses, skirts, and ladies’ pants. Never be afraid to mix and match. Open your mind and read various fashion blogs to have more options on what to wear with cowboy boots.